We present below description of global trends in apparel industry. As an example we present also an analysis of apparel industry in concrete country – in this example it is Poland. We encourage you also to get familiar with our offer prepared specially for clients from apparel industry. Industry analysis of main trends in apparel industry. Industry analysis of global trends in the apparel industry in Poland. Global apparel market was worth 1,7 billion USD in 2012. Compared to previous year, 6% increase has been registered, despite industry uncertainty. Clothes purchasing have subjective character compared to other goods, so this industry is exceptionally shock vulnerable. The industry showed significant recovery after the crisis in 2008/2009 mainly thanks to developing countries; main participants of the apparel industry recorded visible stagnation. In 2012 can be distinguished three main driving forces which stimulated apparel market: significant economic growth in developing countries, visible recovery in the USA after the crisis in 2008 and economic slowdown in Western Europe. The value of sales on the apparel market increased significantly after the economic crisis. It happens mainly thanks to developing countries, where popular brands replace non-branded products. Sales volume of the apparel market have recorded visible stagnation since 2011. It is explained that consumer in West Europe and North America are mainly interested in branded products, which results in smaller purchases of better and more expensive products. The biggest price per unit on the apparel market is in West Europe, while the smallest in Pacific Asia. In Western Europe prices remain on a relative plateau, which was caused by bad economic conditions in last years and bigger competiveness – it results in greater discount and promotion. The biggest price increase in the period 2007-2012 has been recorded in Latin America. Similar increase has been recorded in Eastern Europe – most likely it was caused by the increase of demand and the fact that societies became wealthier. Cotton prices decreased from the peak in 2012 which cased lower pressure on the producers to reach breakeven point. In the same period have been recorded labor and production costs increase, which were greater that decreasing costs of materials – it resulted that in all regions in 2011-2012 had been recorded, smaller or greater, increase of the prices of apparel products. Online shopping gain on popularity and grows at the fastest rate. In the period 2007-2012 had been recorded the fastest sales growth in this channel. More and more popular become m-commerce (trade via mobile devices) and s-commerce (trade supported by social media and friends advices). Stores decorations is one of the most important factors which affects visual perceptions and stimulates sales – because of this facts and due to growing popularity of online shopping, apparel specialists invest more and more in stores decorations. Pacific Asia remains the biggest regional apparel market, despite the economic slowdown in this region. Importance of Western Europe in the global apparel market will decrease in next years due to the growing strength of Pacific Asia. It is forecasted that this region will account for 70% of total sales growth in 2012-2017. Polish apparel market is one of the most attractive and the biggest market in the Central-East Europe. The newest estimates indicate that it is worth about 23,6 billion PLN and its value has grown steadily for the last few years, despite the economic slowdown in Europe and increasing propensity to save. Economic problems, which we encountered in 2009, affected negatively the growth dynamic. Luckily the past forecasts had not occurred to be right and we did not have complete inhibition of consumption, whcich was proved by the results of the research prepared by PMR and called “Retail trade of apparel and footwear in Poland in 2010. Market analysis and forecasts for 2010-2012.” According to the reports presented by the representatives of the apparel and footwear retail chains, almost half of them recorded in 2010 sales increase and the revenues; 40% of all had revenues on the same level. Moreover, sales increase were recorded also in hypermarkets and by internet operations. Individual and private apparel stores were the segments which contributed the most significantly to the inhibition of the growth tendencies. In 2012 PMR company estimated, that the growth of analyzed market will be by 2,5% to 27,7 billion USD in 2012; in 2013 PMR forecasted further growth by 3,6% to the level of 28,7 billion USD. In 2011 we recorded the increase of cotton prices and the increase of VAT rate. Price growth did not decrease the whole demand, but changed the product orientation of Polish customers – they started to look for cheaper substitutes and seek for sales and promotion. Falling consumer purchasing power, which was caused mainly by very slow increase of salaries, may result in the situation that distributors will encounter problems to sell their products out of the periods of sales (there is also noticeable phenomenon of permanent promotion in many cases). Noticeable is also growing demand for online apparel shopping, which encourages companies to introduce this kind of distribution channel. Online shopping gains on popularity in our country, in which 63% of people have access to the internet. 66% of online users in Poland is familiar with online shopping services, whereas in Europe this ratio amounts to 90% – this is a sign of big potential for still not saturated Polish market. Internet distribution channel is characterized by big dynamics but its share in total ways of distributing products accounts only for 4% (specialists estimate that mentioned share will exceed 5% in 2016). Some of clothing elements, mainly these which require precise measurement, like trousers or suits, are still relatively rare purchased via Internet. Similar trend is visible as regards more expensive clothes like winter jackets. More and more popular is purchase via Internet of shoes previously measured in normal shop. Nevertheless the most popular purchasing places are chain stores, where can be found products for each occasion of good quality and competitive price. Brands which are introduced into the market lower the prices to gain the biggest possible market share. Polish people do not have tendency to be brand loyal, so price incentives can be successful. Polish consumer spends average annually about 600 PLN for clothes. In 2011 we recorded the decrease of number of chain apparel stores, mainly of small brands, but big conglomerates also liquidated their least profitable stores. On the other hand the number of discount stores increased significantly (by 20%). Falling trends are also visible in the case of stores with clothes for youths and stores with elegant clothes for men. Still a lot of Polish people (about 1/5) prefer bazaar shopping, although this tendency, slowly but successively changes. Consumer behavior researches indicate that majority of Poles appreciate functionality rather than current fashion when selecting clothes. They prefer clothes which look good in each season and are conservative. In crisis time they select famous brands, which offer products which are characterized by good relation between quality and price – this trend is proved by the opinions of representatives of the biggest conglomerates. Apparel market is fragmented – eight biggest brands account for 1/3 of total sales. The remaining part falls on smaller companies and non-branded products. Among all purchased products 59% are women clothes. The biggest sales dynamic in this category exhibit cheap jeans – 7,8% more sales than in 2011. In case of masculine clothes, leader in mentioned dynamic are shirts (3,7%). Big impact on Polish apparel market have foreign products. Since 2009 Poland has had negative trade balance in case of clothes and accessories. Noticeable is also slight decrease of the value of imported products after the peak in 2009. Interesting are annual dynamic increases of imported products – in 2011 it was 19,8% for clothes and accessories and 22,3% for shoes. 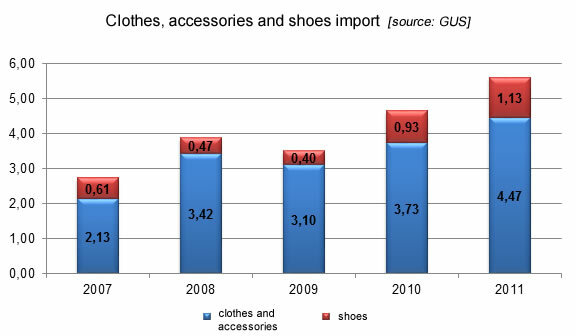 The biggest increase was registered in 2010 regarding shoes import (131,4% more compared to previous year). In 2011 the value of import was 5,6 billion USD. 40% of the products were manufactured in China.